It’s important that investors keep a close watch on emerging markets. That’s where the next financial crisis could be brewing. Be very careful. Before I go into the details, understand what a financial crisis really is: It’s when liquidity runs out and the financial system comes to a halt. Why could emerging markets cause the next financial crisis? You see, as it stands, there are a lot of problems in the emerging markets. We are seeing outright currency collapses in those economies. Their currencies are tumbling compared to the U.S. dollar. This could create a lot of economic trouble in the coming years. Look at the chart below of Indian rupees, for example. 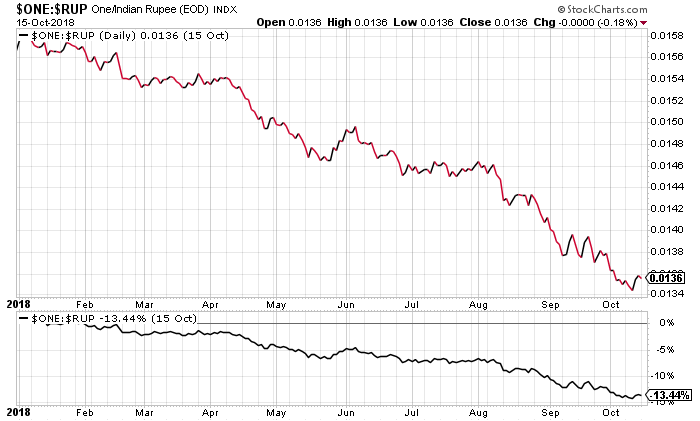 Year-to-date, the Indian rupee has declined by more than 13% against the U.S. dollar. If you look at other emerging economies, such as Turkey, Pakistan, Philippines, Indonesia, Brazil, and Argentina, you will see that their currencies have been tumbling big-time as well. Should You Worry About Currency Declines? Yes, you should be concerned about currency declines. Why do they matter? First of all, after the financial crisis of 2008–2009, emerging market economies took on too much debt. 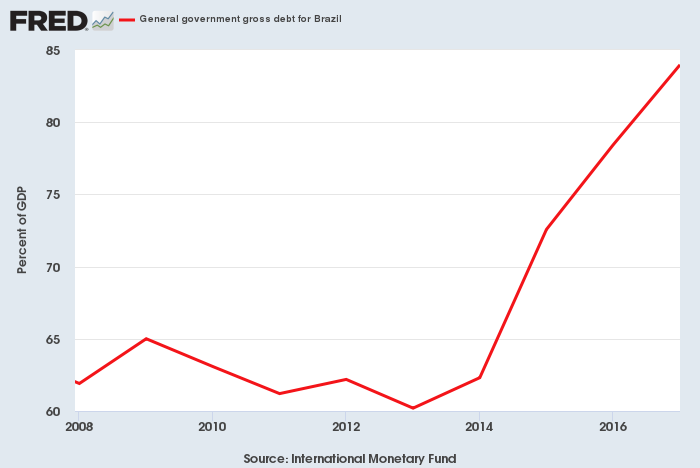 For example, look at the chart below of the Brazilian government’s debt. In 2008, the Brazilian debt-to-gross domestic product (GDP) ratio stood at around 62%. In 2017, this ratio stood at over 83%. This represents an increase of close to 34% in a matter of a few years. Other emerging countries took on a lot of debt too. Here’s the thing: a lot of this debt was issued in U.S. dollar terms. Consider this: If India’s currency has dropped 13% relative to the U.S. dollar, essentially its debt has increased by that percentage. The Turkish lira has tumbled by more than 30% against the U.S. dollar. That means Turkey’s debt has skyrocketed by that percentage. The bigger the collapse in a country’s currency, the more its debt has grown. With all this in mind, one really has to ask what will happen as emerging markets continue to face currency crises. Could it be possible that one or two of those countries will say they can’t service their debts? All of a sudden, investors could panic. In the midst of all this, we could see the financial system grind to a halt. Surely, the amount of money that emerging markets owe is nothing major when compared to the U.S. government’s debt. But don’t forget, if the governments can’t pay their bills, it hurts the stock markets in those countries. Take the Pakistani rupee, for example. It has tumbled by about 25% over the past year. The major stock index in the country has started to sell off. In the past six months, it has fallen by close to 20%. Dear reader, ultimately, the effects of currency collapses in emerging economies will reach the United States. Remember, the global economy is very interconnected. We are told on a regular basis that emerging market risks are nothing to be worried about, but this is faulty logic as I see it. Emerging markets could trigger the next financial crisis.